Houghton Mifflin Company (Printed in Britain by Unwin Bros.), c1927, 189 pages, I believe this is a 1st EDITION . GOOD + Condition Hardcover. Light water marks on covers & endpaper edges, & spine fading. There are NO bad smells, mold or mildew. Pages & Binding are NICE & TIGHT! "The Chinese Puzzle" is an apt name for a book dealing with the complicated politics of the Far East, but Mr. Ransome's vivid pages gives us a real insight. He is as shrewd an observer as any I have encountered, and he provides certain clues which should be of great assistance to those who would attempt its solution. A book about the political situation in China in the early 1920's with some insightful advice on how the British government should deal with the Nationalists. It also covers the British troops stationed in Shanghai. 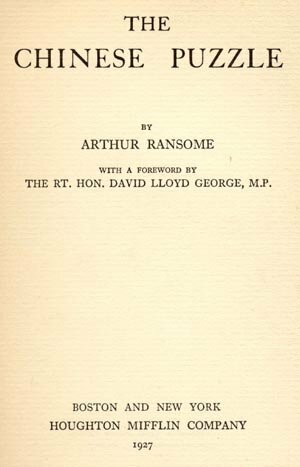 One of Arthur Ransome's RAREST book!! VERY RARE!! Payment must be received within 10 days of the end of the auction, unless other arrangements are made. Buyer pays $4.95 Shipping in Continental U.S. Checks held till clear. Money Orders shipped on receipt. Buyer Must Request Insurance at Additional Expense. IL residents add 7.25% sales tax. Check out our other GREAT Books and SAVE $$ on shipping!